You Find One In Every Car, Kid. You'll See. 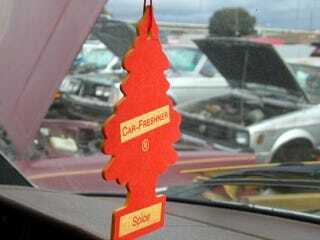 That line by Tracey Walter in Repo Man rings frighteningly true when you go to the junkyard; seems like every other junked vehicle has a Little Tree Car Freshner (sic) still dangling. You can get oh-so-bewilderingly-many varieties of Little Trees nowadays, including the star-spangledy patriotic Vanilla Pride and the sparkly Platinum, the blurb for which states "I'm sleek and sophisticated, like a high-end sports car!" Party With the Repo Men!